With CES 2016 opening at the Las Vegas Convention Center on January 6, the world is on the cusp of “virtual reality everything” with the launch of the Augmented Reality Marketplace. The Las Vegas Consumer Electronics Show launches a disruptive wave of new technology each year spearheaded by a leading tech firm that is about to deploy into the hands of the consumer. It was 4K television from Samsung in 2014 and self-driving-cars and Google in 2015. The mega wave engulfing CES 2016 will be virtual reality, led by the Oculus Rift from Facebook. With a 360-degree 3D optical headset featuring OLED panel displaying 1080×1200 per eye resolution and a 90 Hz refresh rate, the product will have wide compatibility with devices running Windows and on an Intel i5 or higher processor. Oculus was founded by 18-year-old Palmer Luckey, a moderator of “Meant to be Seen” discussion forums, in his parents’ Long Beach garage in late 2011. Two months later, Oculus raised a stunning $2.5 million in a Kickstarter crowdfunding campaign. After developmental prototype sales took off, the company relocated to Irvine and then sold out at a “double unicorn” valuation of $2 billion in 2014. To die-hard gamers, “AAA” means the highest selling games that are backed by substantial budget for marketing and development, such as Minecraft, Doom and Dirt. CES 2016 gaming and virtual reality exhibits will grow by at least 77 percent with the launch of the “Augmented Reality Marketplace.” According to the Consumer Electronics Association, more than 40 exhibitors will showcase immersive multimedia for virtual reality systems and environments. Anchor exhibitors in the space include Oculus VR, HTC, Sony Play Station, Samsung, Virtuix and Sphero. Given the need to make a huge splash to justify the huge cost of a high-visibility booth, it is expected that numerous AAA game makers will spend lavishly to launch virtual reality-compatible products in the Augmented Reality Marketplace over the 4-day show. 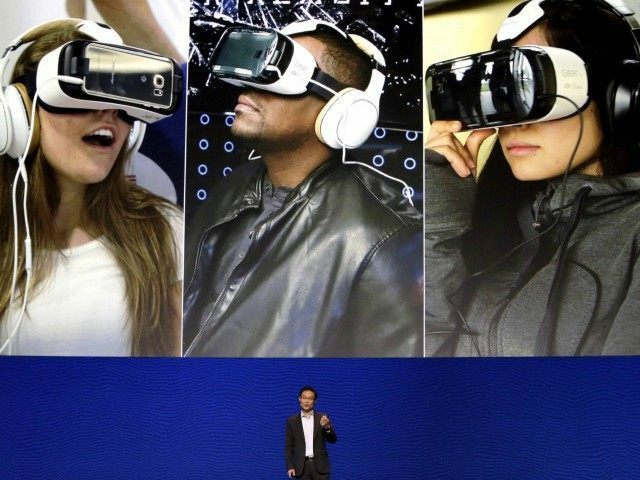 CEA research estimates that virtual reality headsets sale will grow by 500 percent in 2016. Total revenues are projected to reach $540 million, a 440 percent increase by the end of 2015. More importantly, “VR” game sales could reach another $1 billion. A new commercial and industrial market will also be launched in the Augmented Reality Marketplace. Exhibitors such as ASRC Federal for NASA, Occipital, Marxent and others will feature disruptive applications for the military, healthcare, construction, telecommunications, scientific virtualization and other sectors. By teaming up with Oculus on the $99 Gear VR system that went on sale in 2015, Samsung got a huge head start on what consumers need to embrace virtual reality. VR accessories premiered at CES 2016 will include 360 3-D video cameras that allow consumers to capture their own virtual reality content. Ricoh is expected to demonstrate its Theta S 360 camera, which will sell for just $350. It will be able to create material for Google’s low cost Cardboard VR viewer or Gear VR. Phil McKinney, CEO of the CableLabs research and development consortium of cable operators, told USA Today that the CES 2016 will also move beyond games to feature more sports and travel-related VR content.